How do you get new clients? Seminars work very well. When done very well. Here's a review of an invitation in today's mail. Identifying information has been removed. Click on it for a larger image. What's being done is good enough, but unremarkable. Wouldn't you expect a keynote speaker to have meaningful professional credentials? The title is "The Wealthy Neighbour (tm)". Why? I know my neighours are wealthy. So what? Last week, the Toronto Star reported that this is "one of Toronto's toniest and best-educated enclaves" and that "family income tops $170,000". Maybe there will be stories as with The Wealthy Barber or Rich Dad, Poor Dad? Your neighbour is wealthy because they use our services. You don't. So you're not. Will parents attend a seminar the evening before March Break? Maybe they aren't the target. Maybe it was difficult to book the speaker or venue. The invitation looks like a junk mail flyer. Sure, it's printed on nice glossy paper, but many advertisers use that in this neighbourhood. There's no envelope. 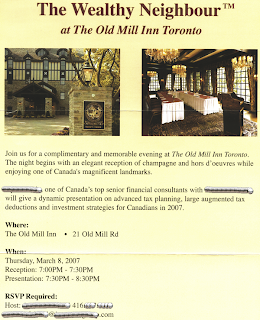 Wouldn't you expect an invitation to a champagne event to have an envelope or be printed on thick card stock that looks like an invitation? Especially in such a tony 'hood? Here's the real shock. The event is in less than 24 hours. I'm serious. There is no advance notice. Maybe the mail delivery was slow. Maybe the printers were slow. Whatever the cause, would you feel like attending an event like this? I want our business to be held in high regard. We sell the invisible: services. Prospects are not able to judge the quality of our services. So they judge what they can see --- the invitation and the attention to detail. Maybe the event will be a tremendous success. Maybe I'm being too picky. Would you trust your money to the organizer?